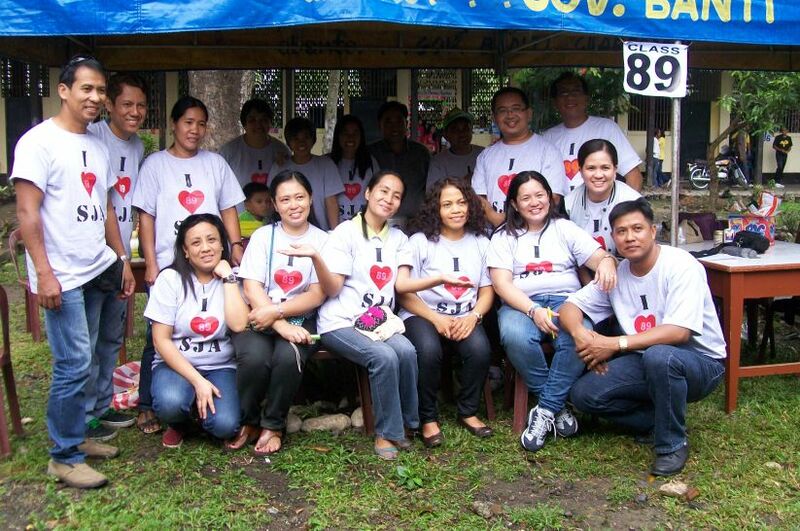 I got a long distance call from Jinky H. last December 27 when we attended the birthday of Hazel in Kinakao. She told me that she likes to meet the batch in January (2013) and I was able to coordinate some of them for meet-up on the 13th. Definitely, she’s forever gorgeous and I hope one day she will find the right man. We had a vegetarian lunch in their house in Sta. Lucia with her parents and some relatives. For batchmate who are there, just see them on this site, and ask me their names. After 4PM, we went to Marilou’s house for her despidida back to the USA and we met Maritess O. and Joel T. The party started with a reflection prayer from Marilou’s churchmates. The food is good and sufficient, I mean, sakto lang. Thanks to Maranion family. I thought it will be the last meet-up, but Joel suggested to have picnic in his farm in Diadi on the 25th and I’d promised to be with them. It was an early busy year for me coordinating with some classmates for I take the opportunity in meeting them once in every five years. 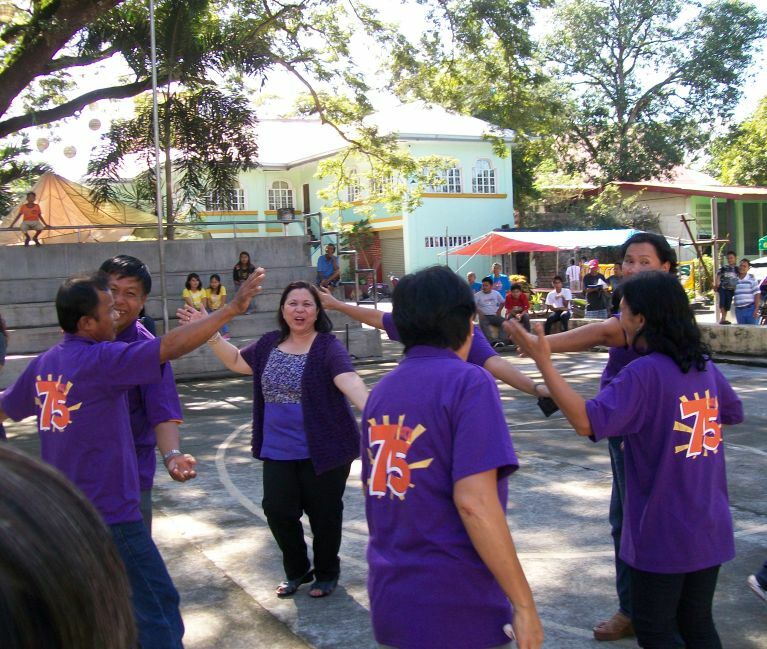 I even proposed to my batchmates to have a coordinator per barangay or area just to fasten the communication in preparation to our 2014 Silver Alumni anniversary. I just hope that it will be a succesful event with my collaboration. And, I pray that they will not get mad on me to my initiative in offering a service with business proposal like the T-shirt and Jacket printing because I’m in to this kind of business. N.B. Thanks to june08.blogspot.com for the above snoopy grad. icon. I’ve seen the movie “2012” twice from a movie house and 21″ colored TV and I can say that it’s more exciting watching in the big screen because of the good cinematic effects. According to Mail Online News, don’t panic on December 21, 2012 because it’s not the end of the world. It’s just a calendar change as stated by one of the trained timekeeper of Mayan clan. This December 2012 is also the 3rd Alumni Homecoming Celebration of my high school alma mater (SJA) and I heard some jokes from some of my classmates that it will not happen. Many beliefs to believe astoundly, I learned from Fr. Bart, a Catholic priest, the cinematic role of St. Jerome during christmas season. According to the story, St. Jerome ask the Lord for the best gift in the world to give to him. And, the Lord’s answered “I want more”. While, St. Jerome answered “Why, I’ve been doing many years the translation of the bible and yet you need more”. The moral lesson of the story by Fr. Bart is the “giving of oneself” to the Lord. St. Jerome was born in Yugoslavia and he raised up from a rich family but he gave all what he have. I really love this story by Fr. Bart and for the past several years of Christmas, it’s only now I learned the great contribution of my Patron saint for christmas. I really believe that life is full of surprises even to the person whom you known ago. 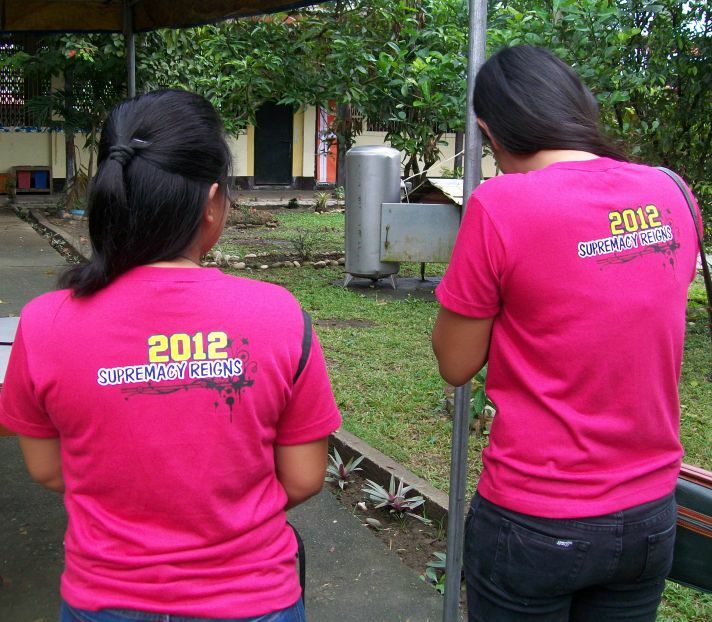 It was fun and sad 2012 Christmas for me because I met my old classmates and one of them is in grief. 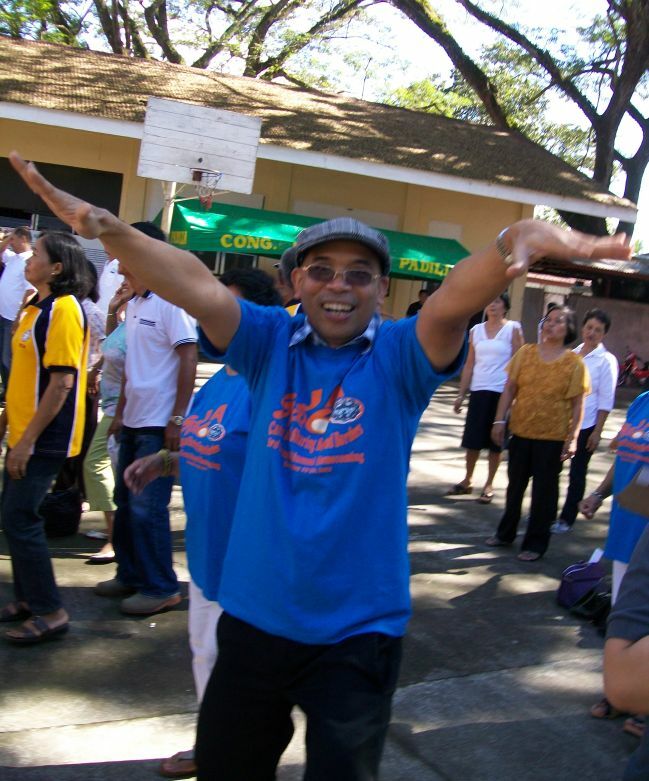 My classmate’s (Lalaine) dad have passed away. 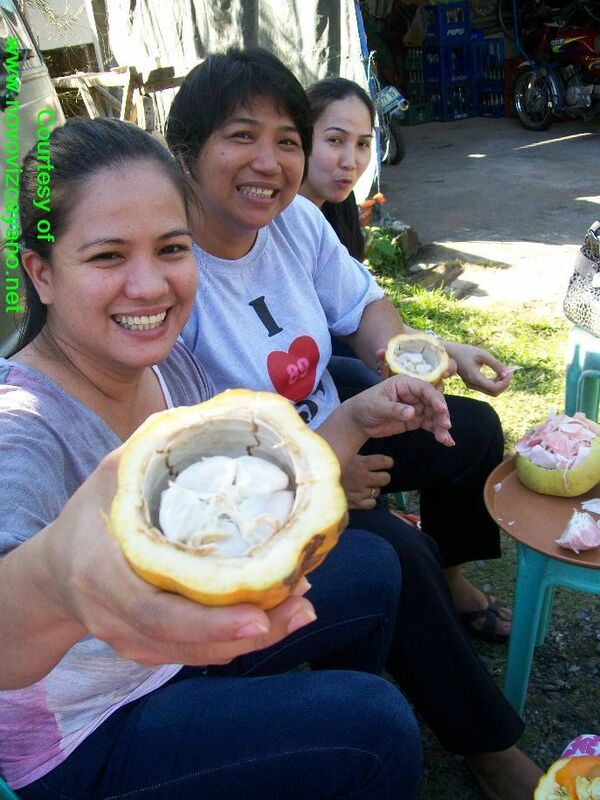 Today, November 22, is the special day to me as we celebrate the Thanskgiving Day here in the Philippines. During my childhood days, I only noticed this special day to the Americans and the symbol is fried turkey. But as I grow old, i realize the importance of this day and I like to celebrate this year with Fr. Theo Bonarius and some jeromian schoolmates. 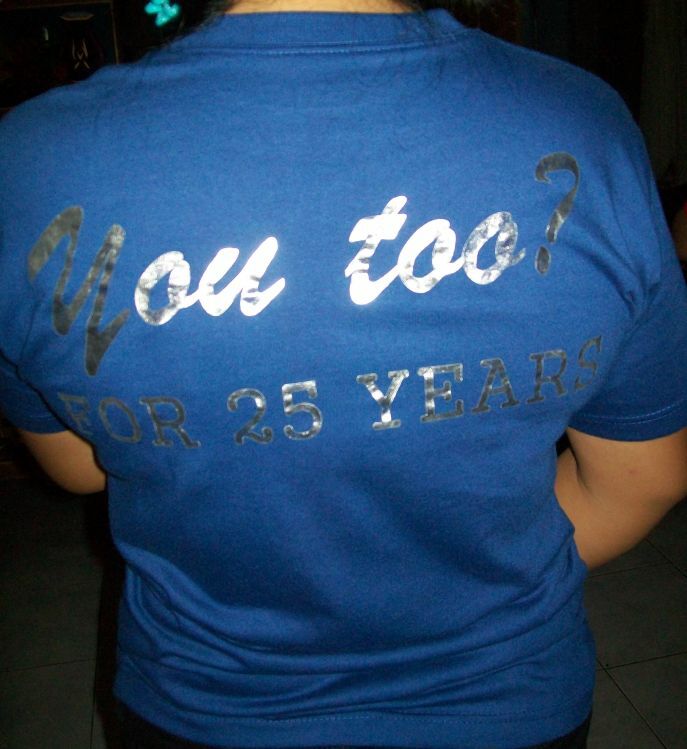 Not today, because I’m on business trip in Pampanga but on Nov. 30, 2012. 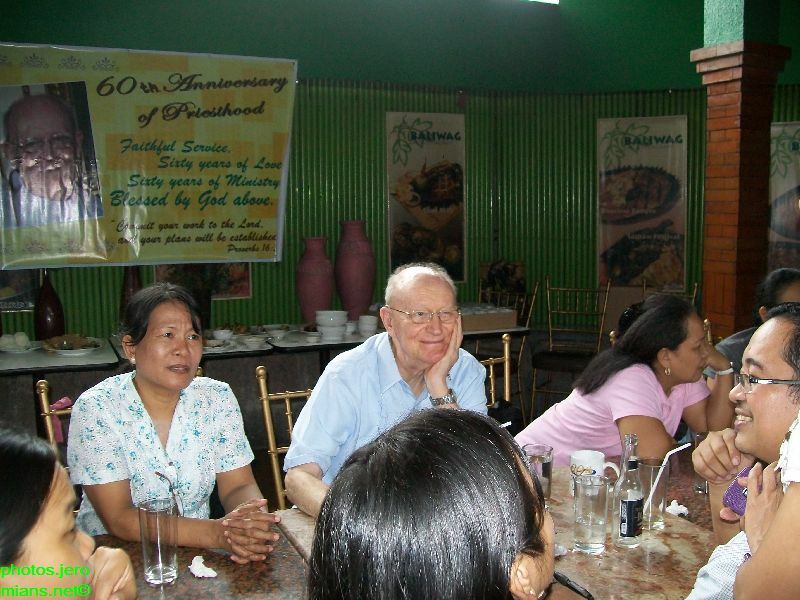 It will be a simple lunch with them to held in Baliwag Restaurant along E. Rodriguez Avenue, Quezon City. If you like to be with us, please contact me at celphone nos. 0922-426-4944/0916-4113811. Or, you may register here. Please come early and bring some gift. If your are a jeromian, please also inform others. We might discuss other matters about the 3rd homecoming celebration. Thank you! It was simple celebration with Fr. 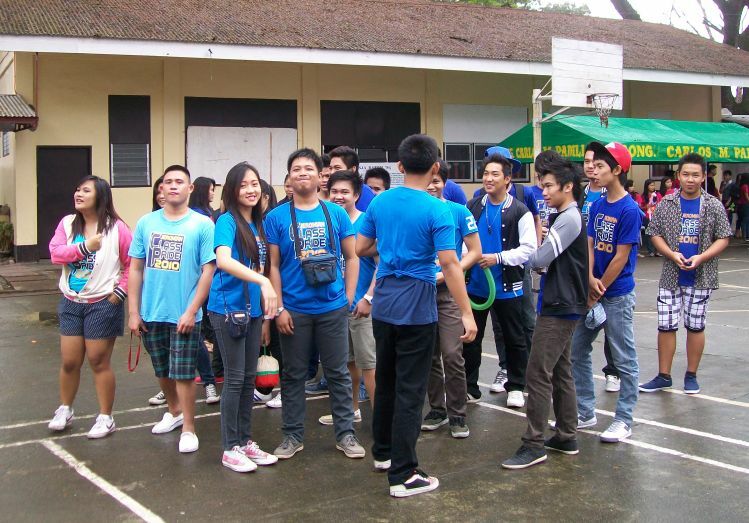 Theo and some jeromians last November 30. 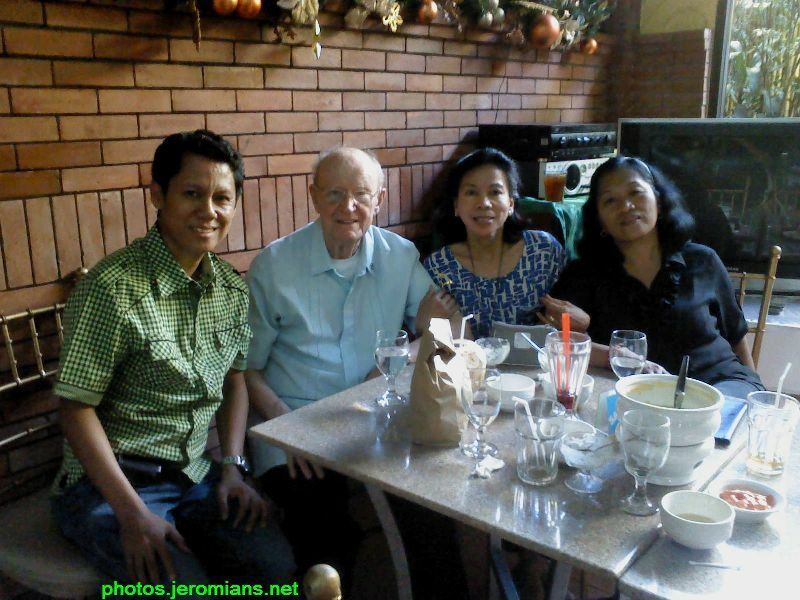 Mr. and Mrs. Elmo Bayaua(B74) and family was there too. 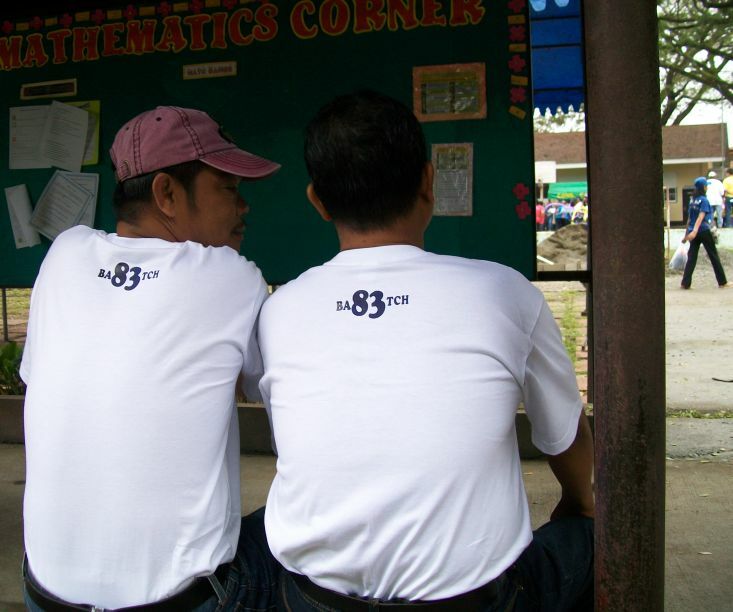 Andy Naig (B89) and Philip Bugayong cheered with Fr. Theo’s stories. We forgot to order a sugar-free Ice tea for him and uttered always “Makammo ti Apo”. 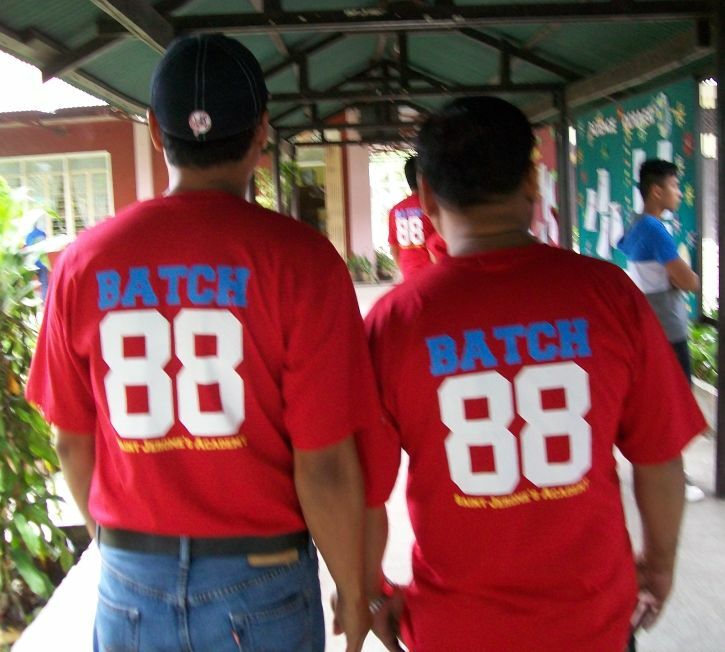 We discussed about the Alumni Homecoming and my my batchmate, ask me if there is a Fun Run activity. I just told him, “sana meron ngang activity for health at hindi lang Diana”. I told them my proposal for annual jeromian meet-up every November to commerate thanksgiving day and Fr. Theo’s birthday (Nov. 3). To Liz Bayaua, please give me your FB links of your camera picture. Paste it with comments below. Thanks! 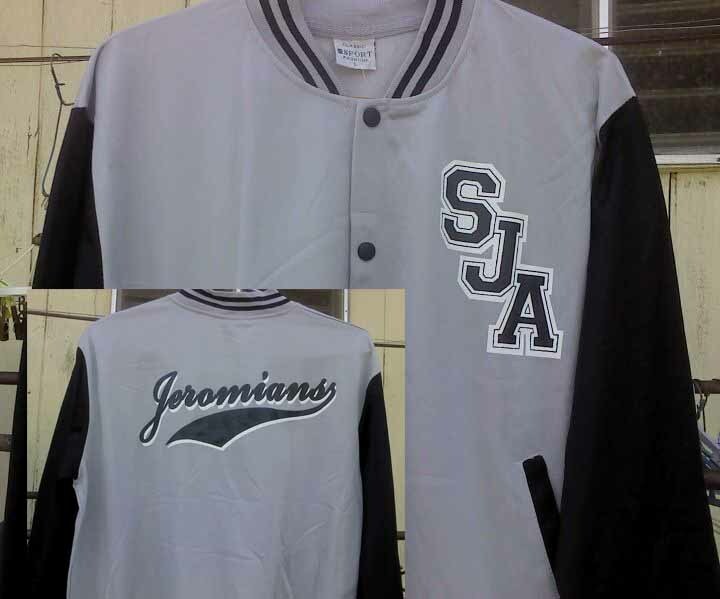 In support to this website and for the 3rd Alumni Homecoming, I designed a Jeromians jacket for sale. The 2 types of jackets are above: Jacket1-(P400.00) with plain color prints and Jacket2-(P450.00) with two color prints. 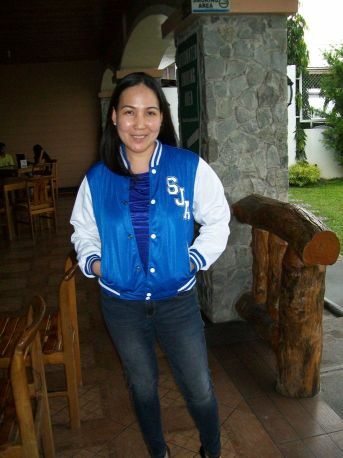 Varsity jacket is a fad here in Manila today and there are many color combination of choice. 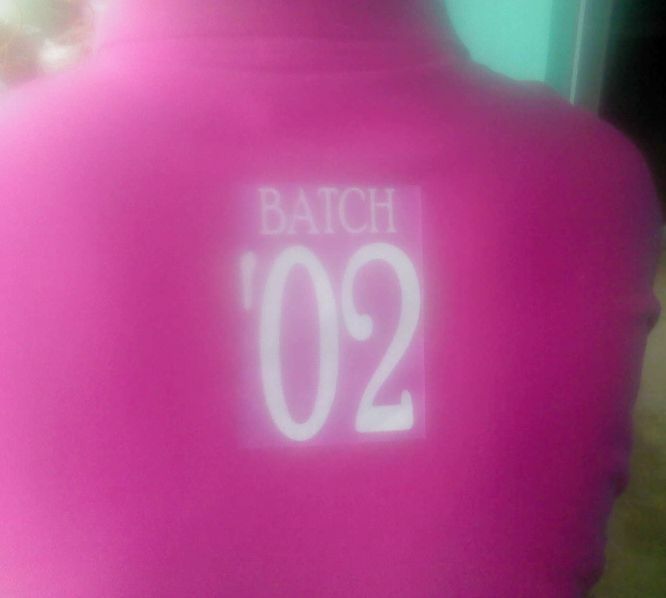 If you have your own Jacket already, just contact me for printing at 0916-4113811 or 0922-4264944. 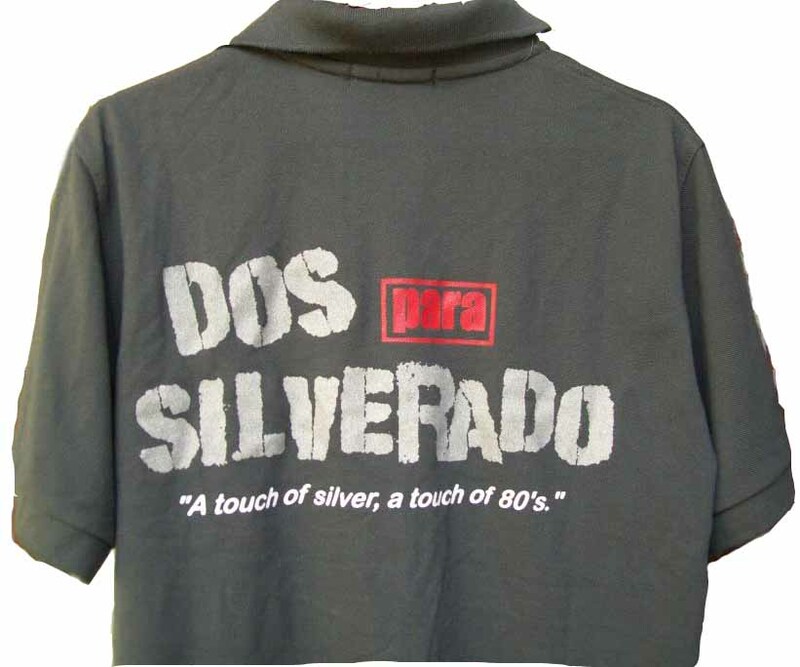 I dont make jackets but I customized prints with your desired color or design using silk screen printing. You may download also the logo below if you opt to use Digital printing (via computer). November 3 is Fr. Theo’s 86th b-day. I am organizing another meet-up here in Manila by the middle of November 15 and Dec. 15 together with him. This will be a sort of pre-christmas celebration to all Jeromians who are in Manila. My main purpose is to organize alumni and plan for annual celebration here in Manila like what the US-based and Canada-based Jeromians are doing. I’m open to suggestions with regards to presentations or contribution for the upcoming third homecoming celebration. You may register here or contact me personally at mobile number 0916-4113811. The possible venue of the party celebration will be at Baliwag Restaurant along E. Rodriguez Avenue. Also, if you like to send a gift to Fr. Theo, just send it to CICM headquarters’ Home Sweet Home-Q.C. at #60, 14th Street, New Manila, Quezon City 1112. 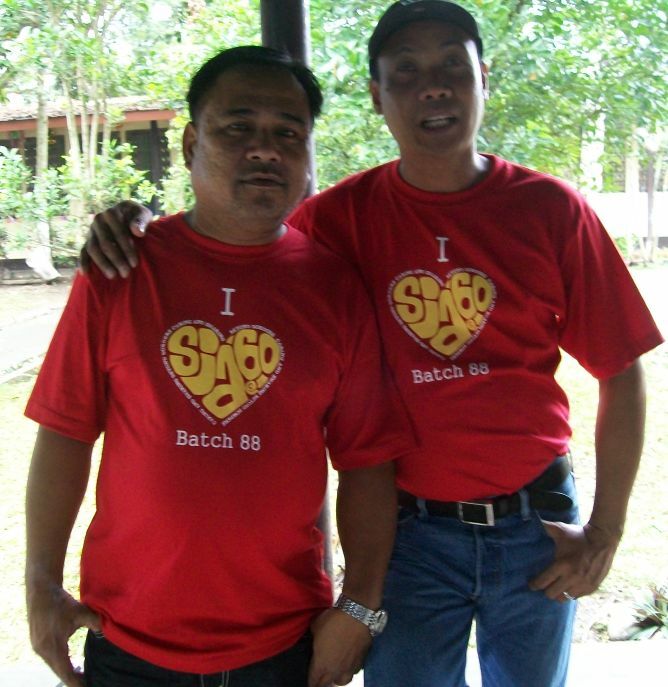 I went home in Bagabag last Oct. 21, 2012 to get our batch 89 raffle ticket qouta for the 3rd alumni Homecoming. I was able to take the picture of the alumni association banners ads (the picture above) on Sunday(19th) morning. I returned in the late afternoon to double check the theme but unluckily the banner disappeared. 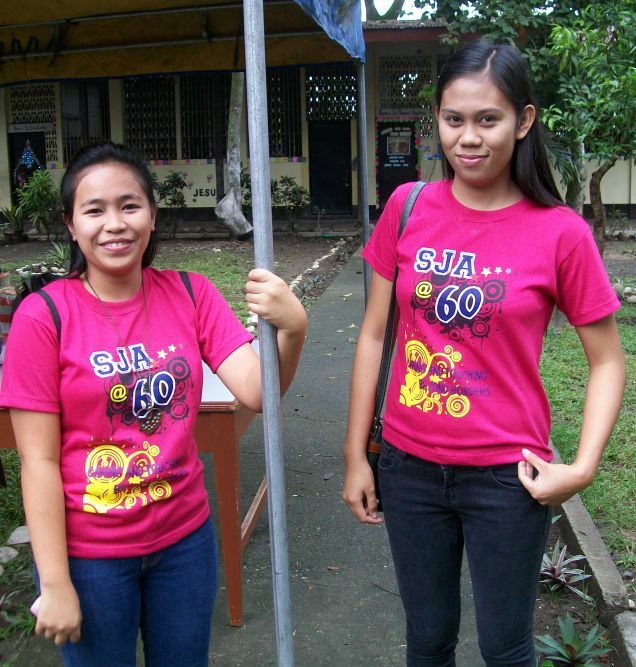 The banner seemed confusing to me because of the number 60 that means diamond jubilee celebration. My mindset is focus to number 75 where it is commonly used in wedding anniversary as Diamond celebration. A week earlier, I’m looking already for the some logo’s or theme for T-shirt design printing because one of the senior batch asked me design their T-shirt for the upcoming homecoming. I also asked one of the officer of the alumni if there was a logo made or proposed for the said event. She told me about the above picture above which I took it using my celphone. 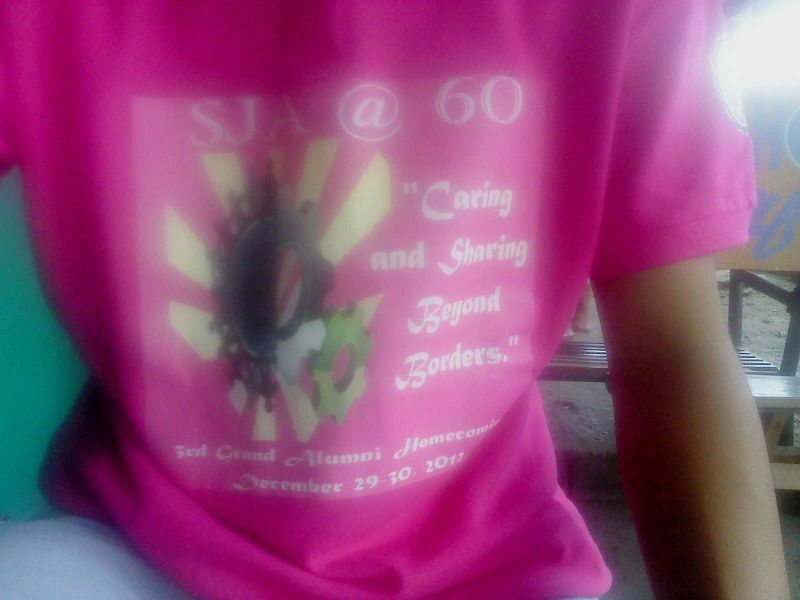 The logo is referring to the word SJA60 and a simple as that. It’s one color and the diamond is inside the number “0”. I proposed earlier from her also to have a more colorful logo but I think I have to just suggest to enhanced it by a graphic artist. I’m just very excited to see the logo the 3rd homecoming but I guess there’s no much emphasis given on the design I am expecting. Practically, I can commission a graphic designer for logo design worth P500.00 as long as it has good definition of colors and graphics here in Manila. But, there was no information I got from the Alumni association that there will be a logo for the third homecoming. This year is my saddest fiesta celebration in Bagabag because my Uncle Nestor Dela Peña of SJA_77 died and was buried on October 1. Aside from electric browouts from Sept. 29-30, we condoled with our relatives together with Ofelia (B75), Genie (B81) and Theresa (B83). 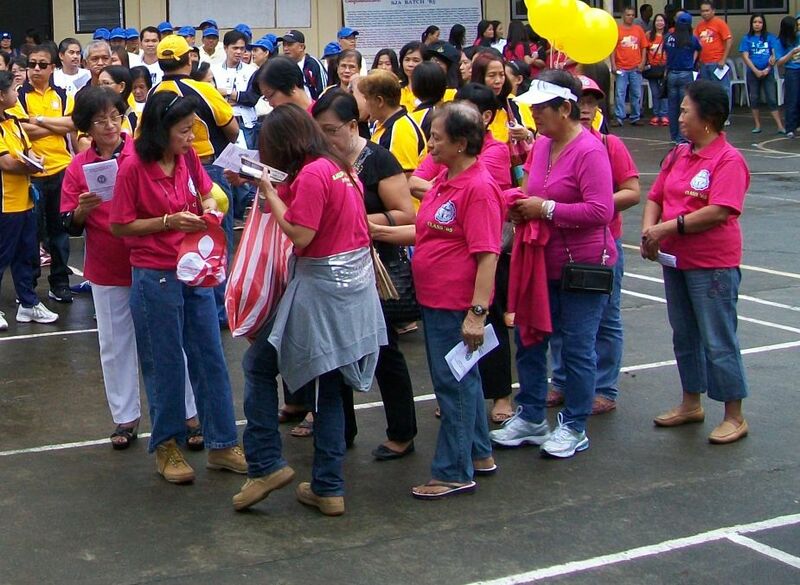 As usual, it’s a rainy fiesta but just like last year, there’s no rain during the Feast day celebration. It was sad to because of what happened to Nestor who got a malignant illness from a 10-year work seaman in a tanker ship. But I think this is an eye-opener to other jeromians with the same profession to consider always his health risk and prepare be ready to the future. I will not try to investigate what really happened but I will be glad if others will give more information about the contract of a seaman navigating on a tanker ship. For the first time in Philippine weather history, the term “bahang habagat” flows. The usual term for Filipino is “hanging habagat” which means Southwest Monsoon and it is a violent wind brought by typhoons of the tropics. Bahang Habagat or “Habagat flood” refers to the massive rain that brought around 80% of Metro Manila into flood. According to reports, 49* people died already from the National Capital Region(NCR), Region 3, Region4 and Region4B. Unlike in 2009 Ondoy typhoon (or Typhoon Ketsana), there was a continuous rain for alomost 12 hours only that causes flood into most part of Marikina City. Habagat rainfall is more than 5 days heavy rain that started in Aug. 4 and lasted in August 9. But the week before, typhoon “Gener” hit earlier the most part of Luzon peninsula with scattered rainshowers. There was a large amount of rain poured in Metro Manila and I think this may be the reason why Marikina City’s Provident Village was flooded again. alam ng buong pamilya . 3. Panatilihin ang palagiang pakikinig tungkol sa ulat ng taya ng panahon. malinis na tubig na tatagal ng 3 araw. kandila, posporo at “first aid kit” para sa posibilidad na mawalan ng kuryente. 7. Suriin ang bahay at kumpunuhin ang mahinang bahagi nito. araw. Ang pagbaha ay mangyayari kung ang lupa ay napuno na ng tubig ulan. 2. 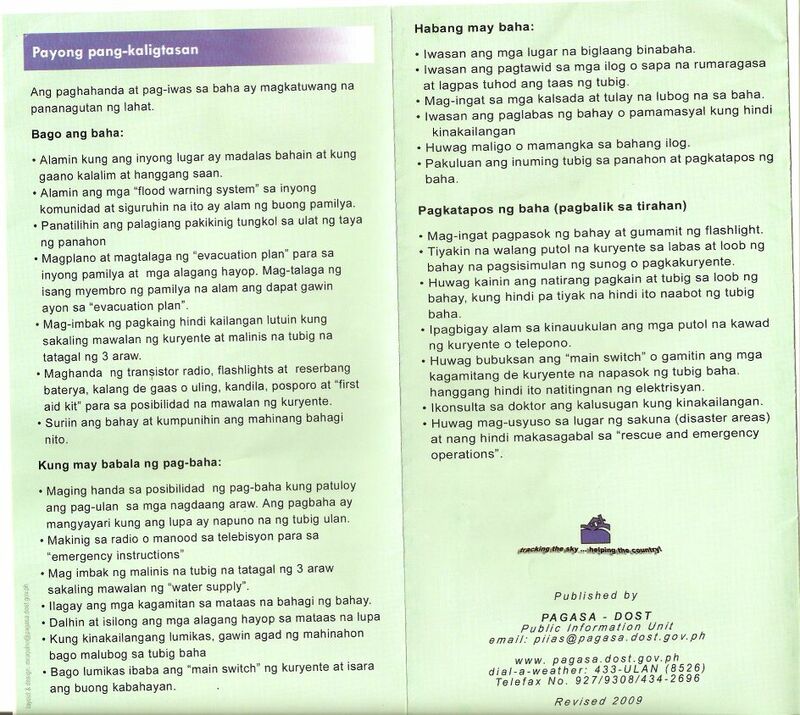 Makinig sa radio o manood sa telebisyon para sa “emergency instructions”. 4. Ilagay ang mga kagamitan sa mataas na bahagi ng bahay. 5. Dalhin at isilong ang mga alagang hayop sa mataas na lupa. 6. Kung kinakailangang lumikas, gawin agad ng mahinahon bago malubog sa tubig baha. 7. Bago lumikas ibaba ang “main switch” ng kuryente at isara ang buong kabahayan. 1. Iwasan ang mga lugar na biglaang binabaha. 3. Mag-ingat sa mga kalsada at tulay na lubog na sa baha. 4. Iwasan ang paglabas ng bahay o pamamasyal kung hindi kinakailangan. 5. Huwag maligo o mamangka sa bahang ilog. 6. Pakuluan ang inuming tubig sa panahon at pagkatapos ng baha. 1. Mag-ingat pagpasok ng bahay at gumamit ng flashlight. hindi ito naabot ng tubig baha. 4. Ipagbigay alam sa kinauukulan ang mga putol ng kawad ng kuryente or telepono. napasok ng tubig baha, hanggang hindi ito natitingnan ng electrician. 6. Ikonsulta sa doktor ang kalusugan kung kinakailangan.